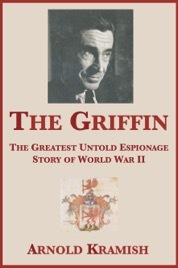 “The Griffin” was Paul Rosbaud’s code name as a spy. Rosbaud (1896-1963) was a distinguished science editor for the German publishing firm Springer Verlag, a close friend of leading physicists who worked on nuclear fission, and, apparently, a pillar of Nazi society. But he was also Britain’s most valuable spy in Germany during World War II. Rosbaud supplied the British with the “Oslo Report” which disclosed, early in the war, details about Germany’s military technology, including the rockets developed at Peenemünde that would devastate London. It was from Rosbaud that the British first learned of the German intent to make the atomic bomb. When they failed to grasp the principles of the bomb, Rosbaud reported that to the British as early as 1942. He passed his reports to Norwegian and French underground couriers who brought them to England. He helped Lise Meitner, the Austrian Jewish scientist who first interpreted the German experiments on nuclear fission, escape from Hitler’s Reich. He even visited concentration camps on errands of mercy. None of this was done for money (when he died, Rosbaud left £500) or for fame (the British Secret Service has kept his record closed), but rather through compassion for humanity and a burning hatred of Nazism.